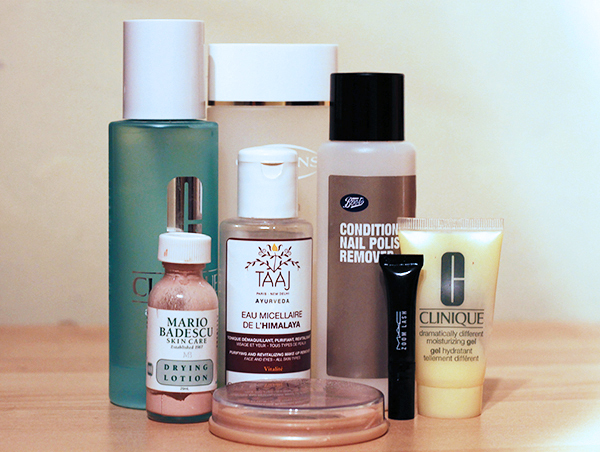 I’ve seen quite a lot of bloggers doing “empties” blogs and videos lately so I thought I would share some of the products that I’ve used up recently. Normally I wouldn’t do this type of post because I wouldn’t like to collect up a bunch of empty products and clutter my room but it turns out that a lot of products I use have all run out at the same time so I thought i’d give it a shot. I quite like reading these types of posts as it shows which products someone actually uses and their overall opinion afterwords rather than a first impression so in a way it’s a lot more useful. As much as I love Clinique, I’ve come to realise that the Anti-Blemish skincare range is too harsh on my skin. It is a good toner in terms of clarifying your skin however I found the high alcohol contents were completely stripping my skin of all moisture. It wasn’t until I discovered the Clarins toner that I realised that this toner wasn’t working as well for my skin. I absolutely love this toner, it feels so gentle on the skin! All other toners i’ve come across have been really harsh like I mentioned above but applying this is an absolute dream. Even though it’s so gentle, I always feel like my skin is extremely clean and fresh. I’ll definitiely be repurchasing this with another bottle of Clarins Cleansing Milk. I received this product when purchasing my Clinique foundation. Everytime you make a purchase online with Clinique they’ll give you at least 2 free sample and usually it involves one of their moisturisers so I was happy to receive this, especially as it is for oily skin. I love this moisturiser, it sinks into the skin so well and leaves it very soft and generally does the job! Compared to the moisturiser for dry skin, this one suits me much more. The only reason why I haven’t purchased it in full size is because I always get one when I purchase my foundation so there’s never any need! I got this makeup remover by chance in one of the many beauty boxes, I think it was Jolie Box. This product is such a pleasure to use and gets all my makeup off so well without leaving a horrible oily residue behind. I’d definitely consider purchasing this again. Possibly one of my favourite products i’ve ever come across. I’ve never seen a product work so quickly or well like this one. You basically apply it to blemishes at night and wakeup with clear skin, its made a massive difference. The bottle goes a bit messy towards the end but still very usable, i’ve already placed an order for another one! Another random product find and all time favourite of mine here. I blogged about this polish remover a little while ago and i’ve finally came to the end. I still stand by everything i’ve said about the product previously and im still amazed that I can get all of my nail polish off with a single cotton bud. I’m definitely going to be repurchasing this. Another all time favourite (Lisas favourite too! ), this post should be a favourites post shouldn’t it! A really inexpensive powder which is great for controlling oily skin and keeping it shine free throughout the day. They have quite a good shade range for pale skin and I can choose between 001-003 depending on the time of year where my skin is more/less pale. I would panic if I ran out of it so I currently have 4 which should keep me going for a while! I received this when I purchased a lipstick from MAC by chance and I wasn’t too impressed. Although the formula is quite a wet consistency (which I prefer), I found the brush to be quite boring and it didn’t really do anything worth purchasing the full size. The size of the sample is great to pop in your handbag and I find sample mascaras much easier to use but I won’t be purchasing this in the future. There you have it, all the products i’ve used up recently. This was a very long post so if you’ve made it this far, congratulations! I purchased every single one of these products with my own money so i’m glad I loved most of them. Let me know what products you love/have used up recently!